Pressure cook green peas in 2 cups of milk. Grind the boiled peas and all the dried nuts into a fine paste adding a few spoons of milk. In a sauce pan, boil the remaining milk and add the paste and cardamom powder and let it simmer for a few minutes until the kheer becomes a little thick. Switch off the flame and garnish with fried cashews and raisins and serve chilled. 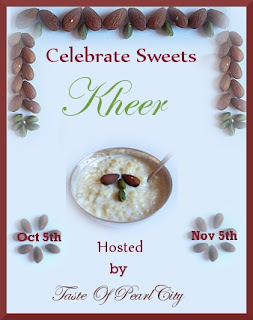 Green Peas Kheer fondly goes to 'Celebrate Sweets - Kheer' event hosted by Umm Mymoonah started by Nivedita. welcome back harini and lovely colour payasam dear.. Very innovative never would have thought to mkae kheer from peas. Omg, wat a creative kheer, never heard about this..